I hadn’t heard of Amazon Mechanical Turk before today and it’s use to try to find Steve Fossett. Amazon’s definition is « we build complex software applications based on the things computers do well, such as storing and retrieving large amounts of information or rapidly performing calculations. However, humans still significantly outperform the most powerful computers at completing such simple tasks as identifying objects in photographs—something children can do even before they learn to speak. Turk was launched in 2005 with much hype (well not so much as I didn’t hear about it) but it seems that the system didn’t live his hype up. Nonetheless, for a few days now, one of the HIT (Human Intelligent Task) has been set up to Help Find Steve Fosset. You will be shown a single satellite image. 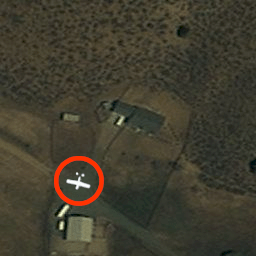 The task is to flag any satellite images which contain foreign objects that may resemble Steve’s airplane or parts of a plane. Steve’s plane will show up as a regular object with sharp edges, white or nearly white, about 21 pixels long and 30 pixels in wingspan. Marked images will be sent to a team of specialists who will determine if they contain information on the whereabouts of Steve Fossett. Example of the size of object to look for. The white plane shown above (30 pixel wingspan by 21 pixels by length) is approximately the size of Steve’s plane. 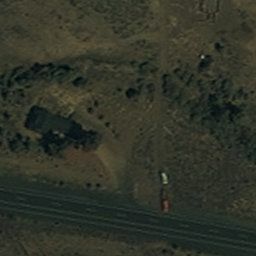 Example of two cars next to a highway/road. You can also check the area on GoogleEarth (38.430862,-119.442673), but first, you have to get Steve Fossett KML file. Je comprends pas pourquoi les gens cherchent son avion, c’ets peut etre plus malin de chercher son héritage non ? Bon je viens de me taper 10 épisodes de Prison Break en suivant sur Betv (intégrale de la saison 2 toute la journée) alors ca doit etre pour ca ..
Ou alors Steve avait aussi un sac a dos avec 5M$ dans son avion ..